Whenever I post pictures of the inside of my house I get questions or comments about the concrete floor. I’ve never talked about it before, and just like most things there is a story behind it. 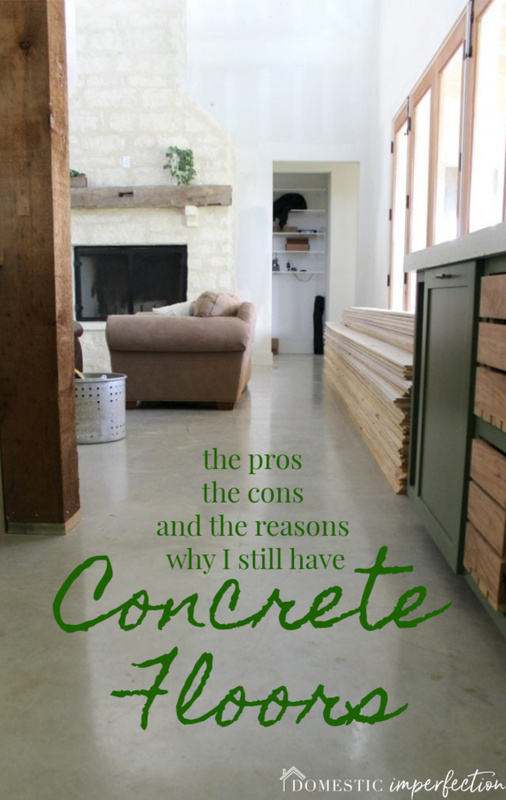 So why did we choose concrete floors for our new home? Was it because we love the look? Because they’re indestructible and easy to clean? Budget friendly? No, no, and sorta. The only reason we have sealed concrete floors in our new house is because we can’t afford to put wood flooring in right now. Concrete flooring is actually a very popular flooring option in our area. You can find it in homes of all price ranges, it is usually stained a shade of brown and sealed or polished. 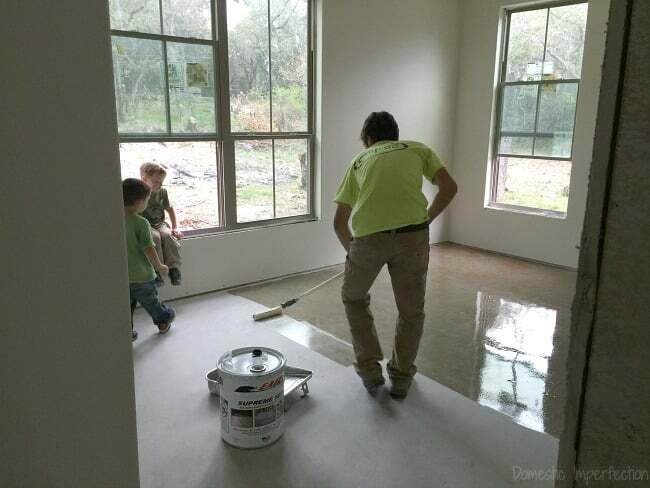 My brother and his wife chose stained concrete for their newly built home, you can see it in the pictures of the living room makeover we did last year. Theirs was professionally done, ours was very much not. We knew from the get-go that we wouldn’t put flooring in our house immediately, the budget just didn’t allow for it. 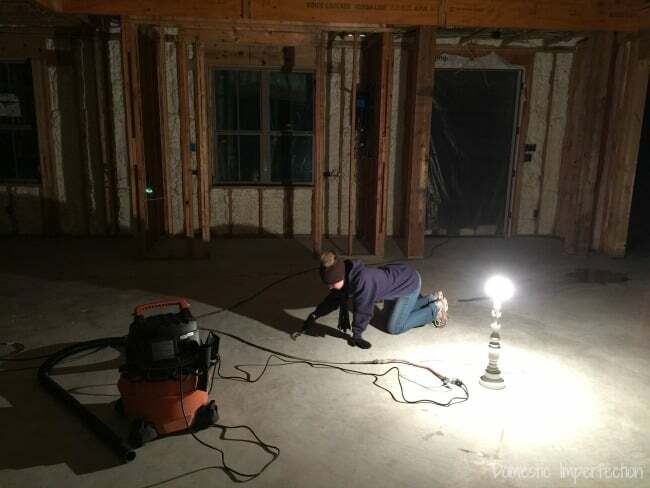 So while they were building the house, right before the mess that is drywall began, we prepped our concrete floors. As you can see, it was one heck of a good time. Adam and I procrastinated way too long and spent a few long cold nights cleaning (pressure washing) and scraping our foundation. 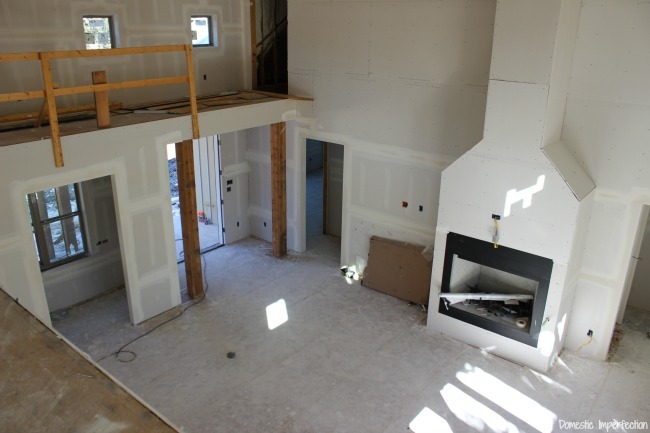 We got it as clean as possible, then we covered it in a product called Ram Board to protect it from all the dirt, drywall mud, texture, and paint overspray that was soon to happen. Ram Board is basically just big rolls of cardboard that you put down to protect your floor during construction (it’s kinda like cereal box cardboard). We had to buy $400 worth and let me tell you…buying temporary cardboard that was soon going to go in the trash was probably the least excited I’ve even been to spend $400. I don’t have any pictures of us putting it down, but this is the Ram Board on the floor after the drywall was installed. Scraping that one tiny area took forever, I couldn’t imagine trying to clean the whole house. It didn’t take me long to realize that $4oo spent protecting the concrete might have been the smartest $400 we ever spent. Anyway, after the walls were finished we removed the RamBoard, gave it one final cleaning, and sealed it. The sealer we used is nothing special, it was the cheapest stuff we could find at a Home Depot. It’s Eagle brand concrete sealer, and we sealed the whole house for about $200. Not bad right? Well, not in that picture…but it’s definitely not something people mistake for our forever flooring when they come over. First of all, there are still holes and chips from construction, lines from framing, and rust spots from nails. Second, there are plenty of areas that wouldn’t come clean and we just sealed in the dirt. For example, here is the area right inside the front door. It looks muddy and gross, but it’s actually freshly mopped and clean as can be. The fact that it always looks dirty is no big deal for now, but it’s definitely not a look I want sticking around for the long haul. So how is it living on a concrete floor? Here is what I like about it – I really like that it is easy to clean and indestructible. There is no grout to get dirty and grimy like tile, you don’t have to be careful about getting it wet like wood, and it doesn’t trap in dirt and sippy cup spillage like carpet. In that aspect it’s the perfect flooring for our house full of boys. 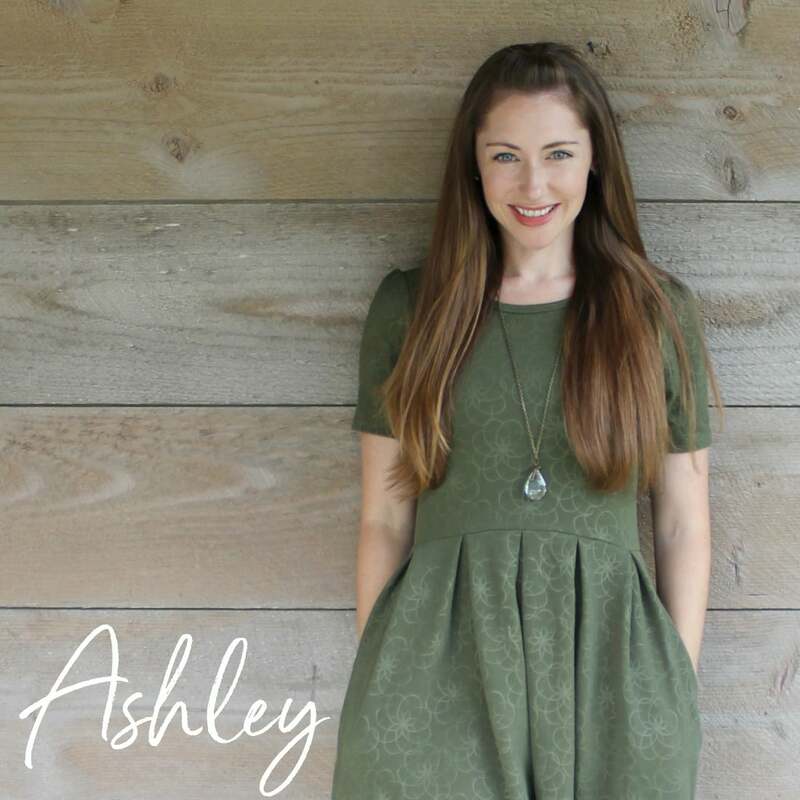 What I don’t like about it – While it is a great temporary solution I would never consider a concrete floor as my forever floor, for a few reasons. The first being that I don’t like the way it looks. I’ve seen many houses that concrete looks great in, but in mine it just doesn’t feel right. 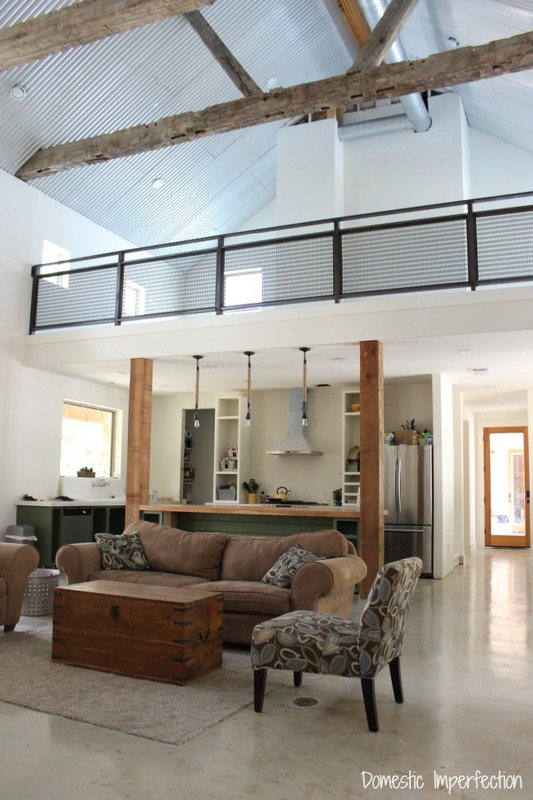 Our house is a more rustic farmhouse type that needs the warmth and coziness of wood flooring, and the concrete would be better suited for a modern/industrial type space. It just feels unfinished to me, and with the high ceilings and open floor plan also a bit like a gymnasium. I also don’t like how it feels. It’s SO hard that my feet and ankles are sore by the end of the day, plus its crazy cold in the winter. Also, my kids may not be able to hurt the floor but the floor certainly hurts them. We have had lots of bumps and bruises, plus a prematurely loose front tooth from my boys living life on this floor. Not to mention that the baby has taken to crawling on his hands and feet to try and save his knees. His bear crawl is adorable, but I also kinda feel bad for him. Aren’t those amazing? 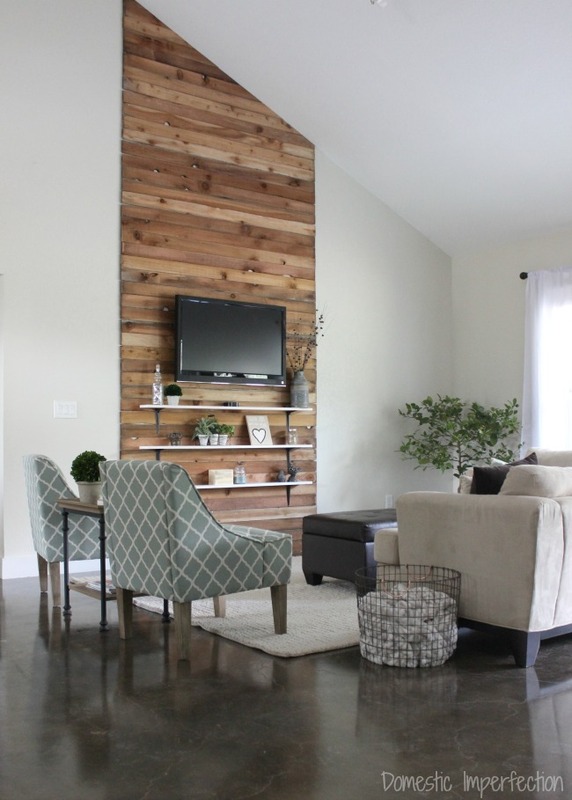 When we first started building I got a few quotes for putting reclaimed wood throughout our house and the bids came back around $25,000 for materials alone. That number is way over our head, so we will have to find a way to get the look for a lot cheaper. One of the reclaimed wood companies sent me a 12 month calendar that featured homes with awesome old floors, and each and every month in 2016 I drooled over that thing like other women would drool over a calendar filled with chiseled fireman. That’s all I can think to share about our floor, plus I think there’s a certain poetic beauty to ending a post about concrete flooring with “chiseled fireman”. 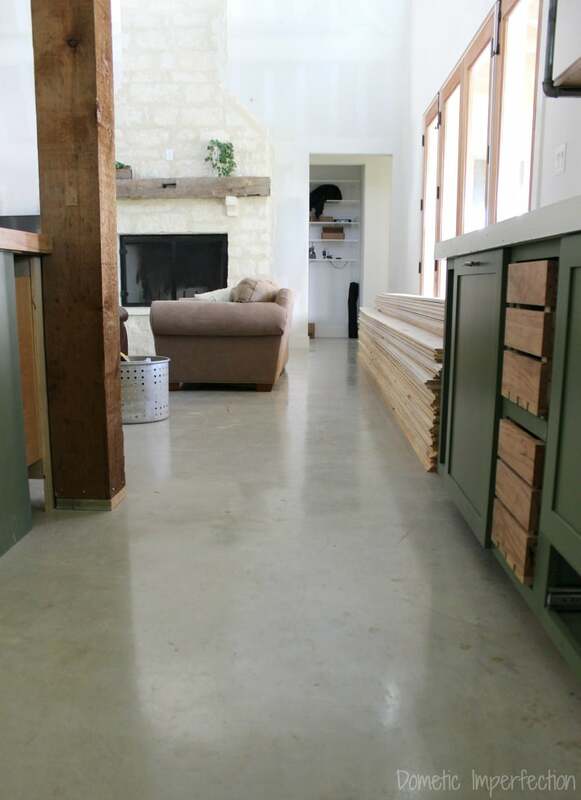 I visited an amazing DIY house in Glen Rose, TX in which the owners laid the flooring themselves. They just bought different sized pine 1Xs from local lumber yard/home improvement store and randomly laid them out in the house. It looked awesome and they’ve lived there for 15 years. They said it was cheap cheap. 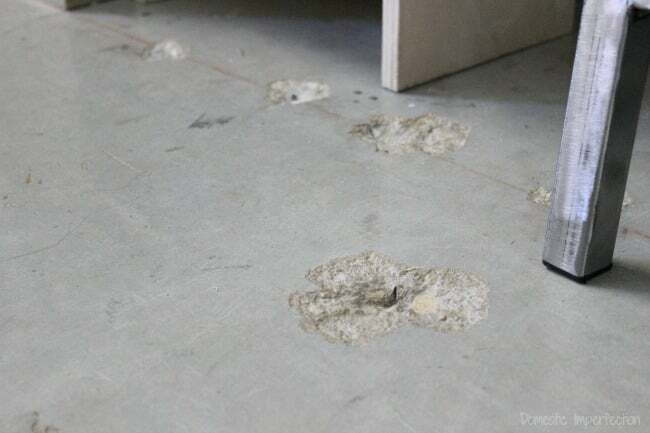 I have concrete flooring in some parts of my apartment (chosen by the previous owners), and I can add a new con: if one tiny part gets ruined, you can’t fix that, like you would do with wood… you have to change/re install the whole floor. That’s why I have small rugs here and there, lol!! But yes, they are easy to clean for sure! You can always get a “lower grade” flooring, with knots and holes, etc. We got a low-grade oak for our kitchen that already had tons of 1960s oak flooring, and the new stuff had a LOT of variation, (light, dark, knots, smooth, etc) which everyone loves when they see it. It looks kinda similar to the third picture of flooring you posted. I wish it was over the whole house and not just the kitchen. 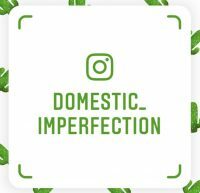 And way after the fact, I found out any of the worst knotholes I could have filled in with fiberglass resin (from your gorgeous pecan countertop post, actually). That stuff is awesome, sands like a dream, and fixes any of the worst of the flooring issues. Super cheap and actually has more character than “reclaimed” lumber. Just a thought. 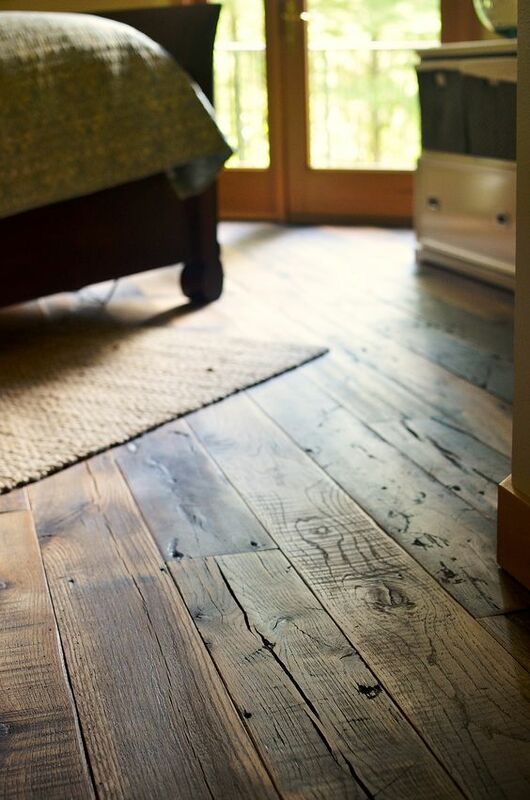 The wood floors are definitely more beautiful than concrete. I have stained concrete in the living room and am a huge fan of it . It is super easy to clean, no worries with spills if it is properly sealed, no grout lines to clean (huge! ), dirt and dust are easily removed verses carpet. I can carry fire place ashes across it without fear of a fire. No longer worry about a spill on carpet when entertaining. A fresh waxing with high traffic wax and it looks brand new. And dang… this free flooring is already there, yet it must be protected from the construction damage. And if one changes one’s mind….anything easily goes over it,wood, tile, carpet or area rugs. 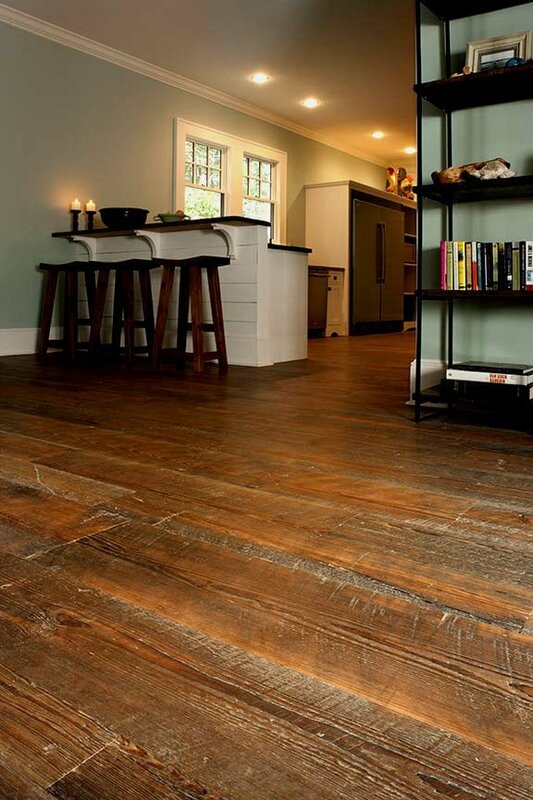 Yet again, those wood floors above are gorgeous, I am just to thrifty/cheap:) I am going to admire yours! 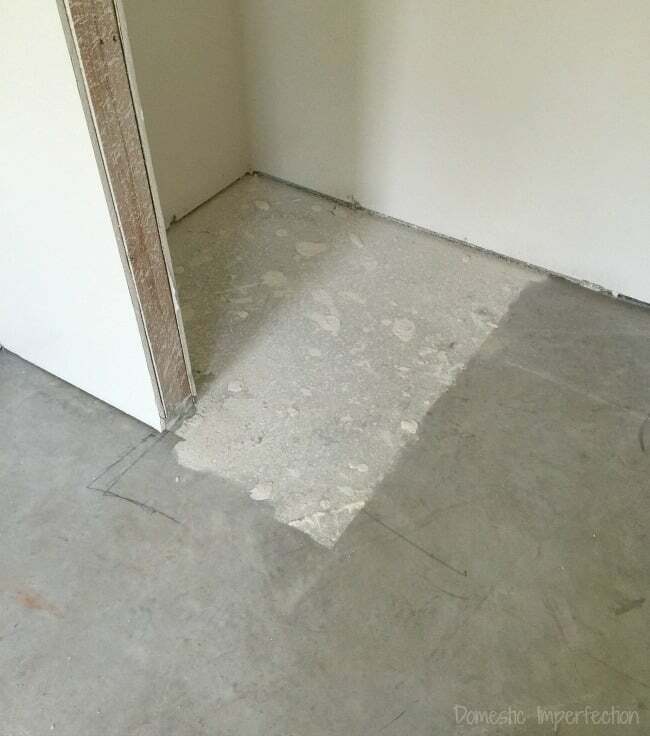 My idiot, I mean, dear friend who lives with me who thinks he is super wonderful, decided while I was away overseas and to surprise me, to put a poured concrete floor in under the house. The house is split level and that area has three ‘rooms’ One is my workroom and the other two are like car-space for parking. He heard me saying how I wanted to convert one of them into another bedroom. He got it wrong. I wanted ONE of them to be a bedroom but not the middle one, the END one, ning nong, the end one. So I am stuck with a room which looks like a mechanic lived there. NO way is that ever now going to be able to have floorboards like I wanted. 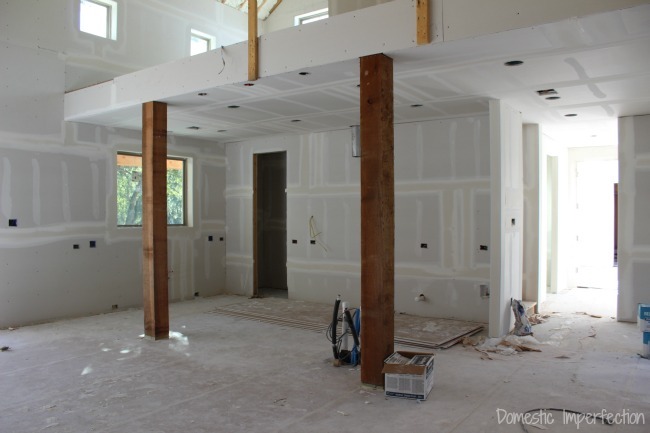 He got it poured so high you need a couple of steps to get in and that makes the ceiling height too low and more so if i put boards down….sigh…. Now I have to hire a concrete sander to smooth it down, get a polisher and then seal it. Double sigh…..Oh well, at least it was the thought that counted I suppose. I wonder if there are any cheap rugs for sale somewhere? 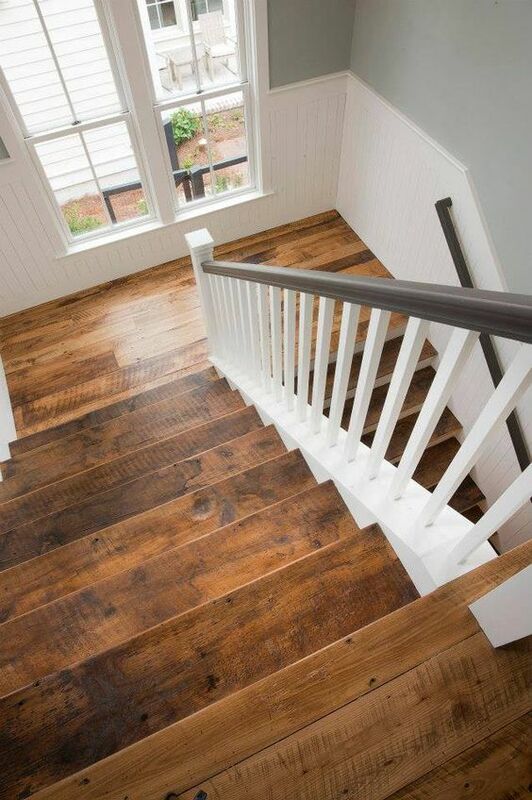 Those wood floors in the pictures are gorgeous! It sounds like there are some good suggestions in the comments already for a cheaper way to go than $25 000. That’s crazy!! 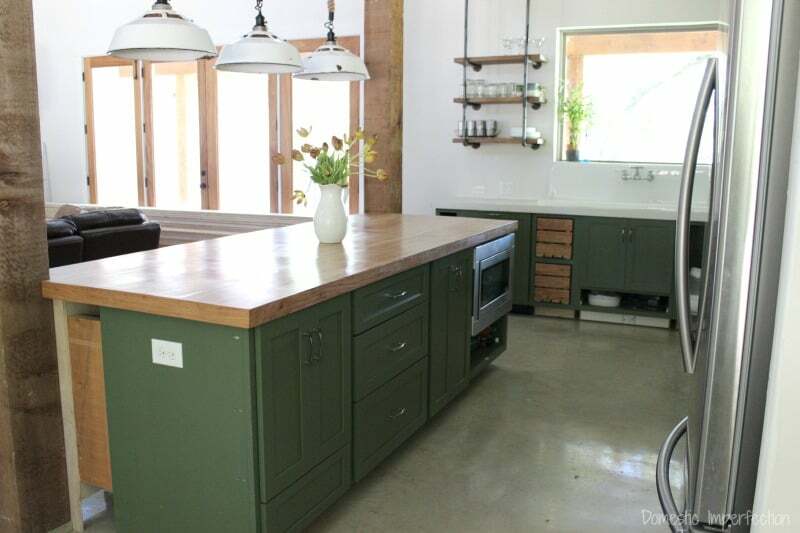 I love the look of some of the polished concrete floors, but I would never want one. Concrete is just so cold, I would die. Even if I do live in the only part of Canada that’s below the 49th parallel. Plus your point about the boys getting hurt is very well taken. (I imagine the baby’s bear crawl is super adorable though!) You could consider getting those foam puzzle squares to put down in the playroom, maybe using some double sided tape on the concrete to keep them in place. That would make that area a bit more kid friendly. Kudos to you for waiting instead of going beyond your means, back into debt. That takes discipline, but it will be worth it! 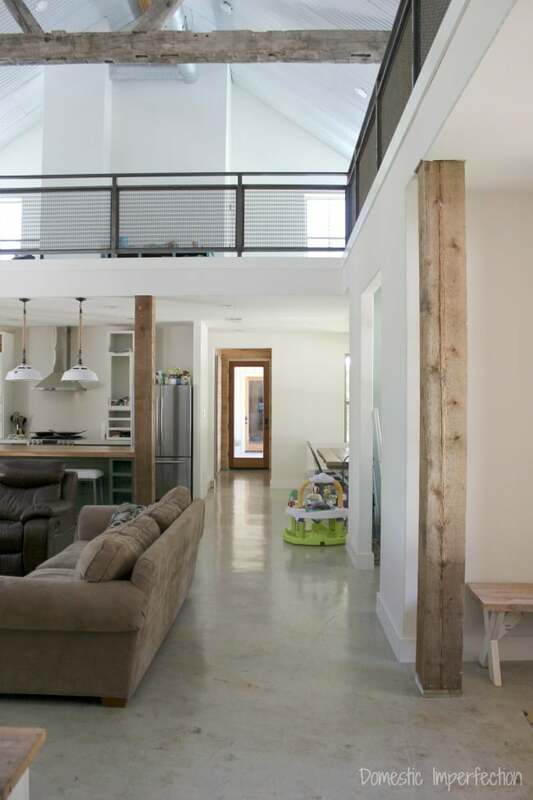 Just a note about the super distressed wood floors as far as practicality and children. They are absolute crumb catchers and you have to vacuum for sure. I am not at neat freak by any means but omg the visible dirt in the cracks drives me bonkers. Also, spilled milk or food that you don’t clean immediately in one of the worn areas becomes something you have to scrub with a brush to get the gunk out. The grooves and uneven boards are also a big pain for little ones learning to walk. They will trip on every groove. As beautiful as they are, I curse them daily lol. I really wish I had a nice quality laminate “wood” or wood grain tile with super thin grout. Poly is what messed up….the cloudy and being able to scratch it up..
Urethane…is what you need to ….Poly is plastic…..it gets old quick..
Love how your house is coming together! 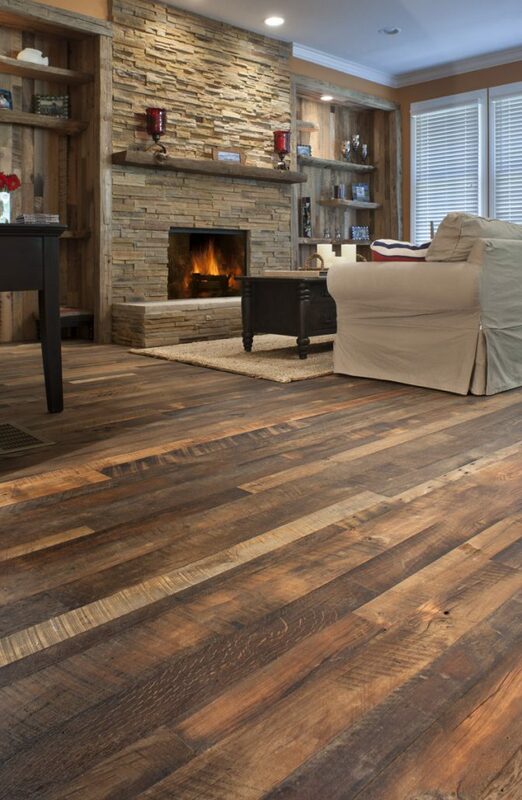 I really wanted the look of reclaimed wood floors, but the real thing was too expensive and even laminate options were put of our budget. We ended up putting in utility grade oak, and we love it! It was by far the biggest diy project we’ve undertaken yet, but it was great for our budget and gave us a similar look to the reclaimed wood. I live in a house with concrete floors and always would wear crocs, those rubber shoes. But my sister gave me a pair of sandals called Havaianas, they are flip flops from Brazil and honestly my back and knees never, ever hurt on the concrete floor when I would wear those flip flops, it is amazing. They are thin rubber but amazingly comfortable. Hope they can help you in the meant time until you get your wooden floors. 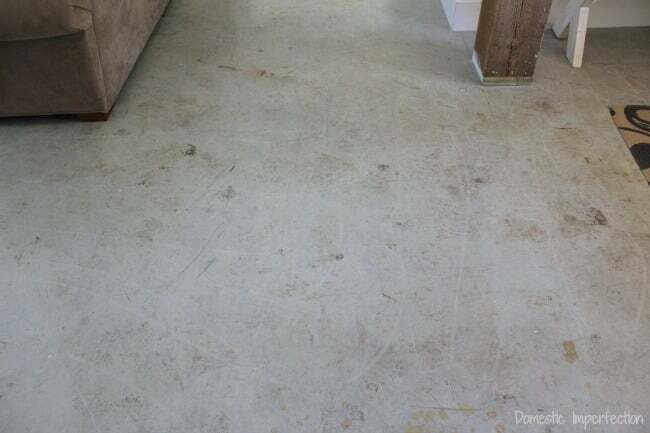 My wife and I have been thinking about having a concrete slab flooring installed in our house. I agree that it is a temporary solution. I want to do it until I can put wood in ontop also.